Ren� Harrop... Master fly tyer and artist, guides you through each of the five life cycles of the Caddisfly. 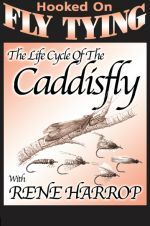 Ren� Harrop... Master fly tyer and artist, guides you through each of the five life cycles of the Caddisfly. Caddisflies are one of the most dominant and important aquatic insects to fly fishers and fly tyers. They differ significantly in actual appearance and in what is required to tie them correctly. Cul-De-Canard (CDC)... Small feathers that surround the preen gland of ducks and geese. This delicate but durable material possesses extreme natural buoyancy and flies tied with CDC float well on their own due to the natural oil. Includes special Artistic Montage... The creatures that inhabit lakes and streams are the subjects that most influence the art of Ren� Harrop. Ren�'s life long love of trout fishing is evident in his sensitive and finely detailed paintings and drawings. Learn to tie: CDC Cased Caddis Larvae, CDC Boit Caddis Pupae, CDC Transitional Caddis, CDC Palmered Caddis Adult, and CDC Spent Caddis Adult.